1. Pick a story!! 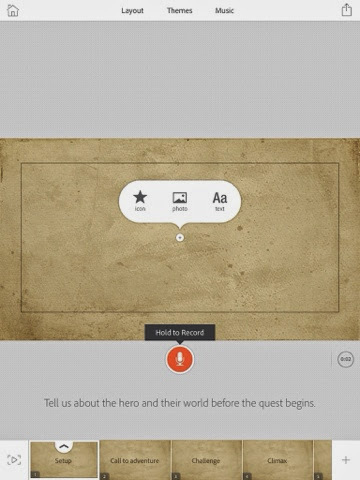 Adobe Voice gives you options as to what kind of video you want to create. This may sound rather elementary but sometimes the hardest part of creating a presentation is planning the steps out. Adobe Voice allows the user to choose from 9 different story types. Want to create a video that explains something? Adobe Voice has you covered! 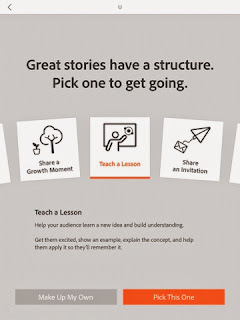 Want to create a 'hero's journey'? Simply select that option and away you go. For example, the hero's journey story line includes pre-made slides such as: the setup, the call to adventure, a challenge, the climax, and the resolution. Of course, you can always add more slides to your video as you see fit. 2. Easy to use layout!! The layout is seamless and convenient. You can customize each slide (a la PowerPoint or Google Slides). 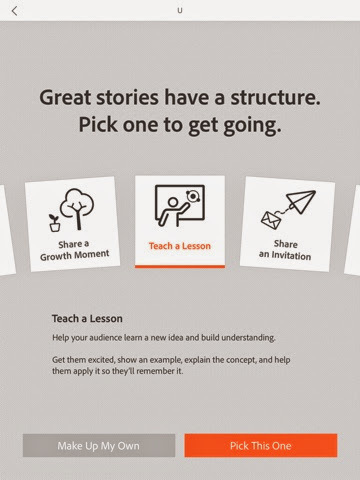 You can select the layout of each individual slide, making each part of your story look like it's been edited by a professional. Simply select one of the slide layouts (one thing, two columns, full screen photo, thing and caption, and thing and full photo). If your wondering why I'm calling them 'things,' it's because you can input text, photos, or select an icon from the Adobe Voice Creative Commons-licensed images. 3. Icons!!! Select from thousands of Creative Commons-licensed icons and embed it directly into your video. 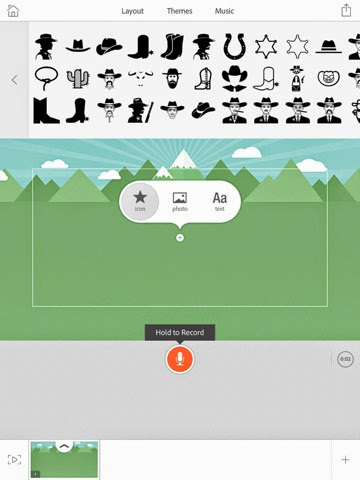 I typed in the word 'cowboy' into the icon search and 65 icons appeared of various cowboy pictures. This allows the user to create videos that would be considered fair use. 4. Custom themes!!! 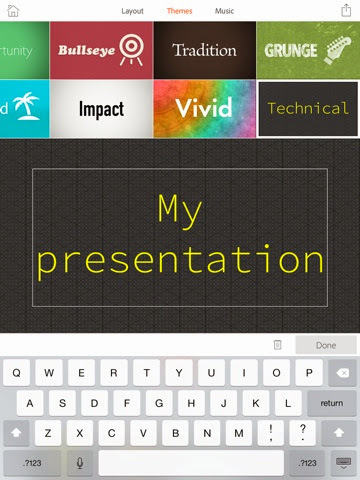 Adobe Voice allows the user to choose from over 3 dozen custom themes for their presentation/video. Each theme provides the user with a different color, text font, and background design. If you are looking for complete control of design (I spend way too many hours customizing my blog and webpage!) then this might be an issue, but if you are looking for an efficient and easy way to create videos, this is the app is for you. This option automatically changes any previously designed slides, including the text or icons already added. 5. Use their music!!! Adobe Voice has over 3 dozen stock background music options. Want your video to be dramatic? They have an option for you. Want your video to be fun and playful? All songs offered through Adobe Voice comply with fair use. They have an option for that. You can also use music downloaded onto your iPad. 6. Easy sharing options!!! 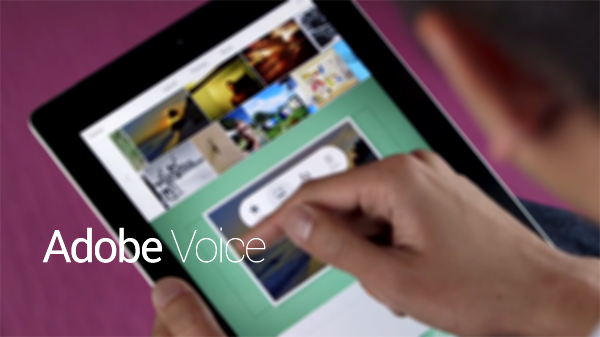 Users upload their video directly to the Adobe Voice media gallery. You can also have the choice to share on Facebook, Twitter, email, message, embed in a blog, or copy the link and send it. What's missing is the ability to upload your videos directly to your YouTube channel. I heard through the grapevine that Adobe is working on this so hopefully they will offer this option soon. 7. Citations!!! This app actually compiles the sources of your content (all content used from Adobe Voice's icon and music database). You will see the sources cited at the end of your video. This further reinforces the importance of 21st century skills, particularly the emphasis on digital citizenship. Well, that about sums it up. 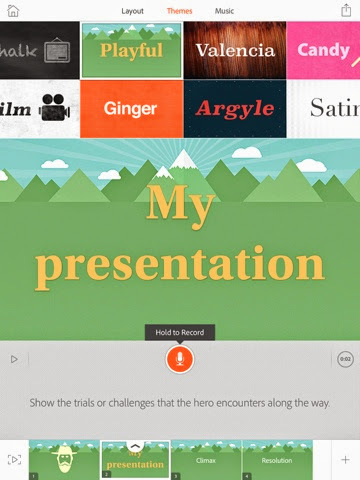 Adobe Voice offers some really wonderful features for students and teachers alike. You can use this technology to create your own flipped lessons or have students create fun and creative presentations. Hopefully, they will offer this technology on other platforms but I suspect that for the near future, iPad will be the only platform to offer Adobe Voice. Pros: Easy to use, professional looking videos, complies with fair use laws. Cons: Only available on iPad, can't upload to YouTube, limits on design options.